Philadelphus or ‘Mock Orange’ are a fragrant deciduous shrub growing from 1m to 6m. Philadelphus have masses of fragrant white flowers late in spring, the heavily scented species being a must for the fragrant garden. Philadelphus do well as a feature shrub or at the back of the perennial border. Philadelphus ‘Beau Clerk’ with its large flowers is one of our favourites. Philadelphus delavayi (pictured right) is a wonderful species from China although not widely offered by wholesalers. Full sun to partial shade in a moist well drained humus rich soil (the more sun the more flowers). 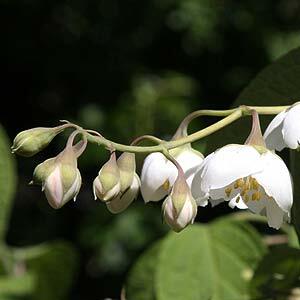 Philadelphus may be prunes to maintain shape. Excellent in mixed border plantings or as feature plants near pathways where the fragrance can be appreciated. All grow well in a humus rich well drained soil with protection from the afternoon sun. Wholesale growers offer a number of varieties all fragrant and all with attractive flowers. P. x lemoinei – Old fashioned bushy shrub, masses of white flowers bred in France in the late 1800s. P. ‘Beauclerk’ – Flowers are large and have a pink blush in the centre, excellent when trained as a standard. P. Belle etoile – Large flowers, blushed with pink in the centre, very fragrant tending towards a small arching shrub.